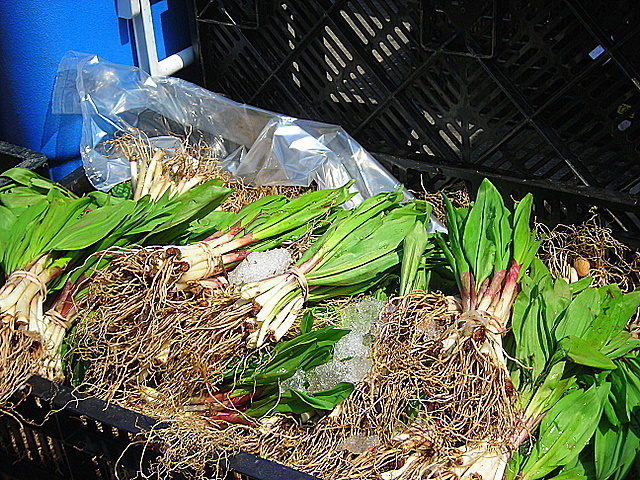 One of the greatest of spring’s pleasures is the appearance of ramps at various farmers’ markets in New York City. 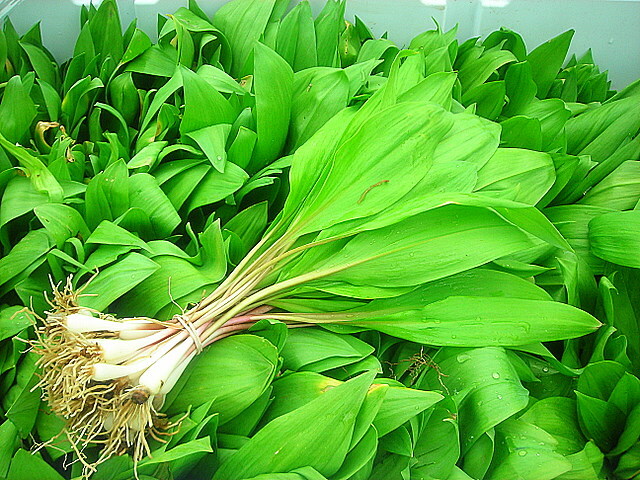 Ramps, otherwise known as Allium tricoccum for the botanically inclined, are a type of wild leek that’s commonly found all along the eastern seaboard of the United States, as well as the Canadian provinces of Quebec and Ontario. They’re only available for roughly six weeks a year, from late March to mid-May. It’s an extraordinarily brief window of time, so much so that many people (including yours truly) go into an orgiastic frenzy in an attempt to use them in as many dishes as possible before bidding them farewell until their next appearance the following spring. They are among the first green things that appear at the market, after an eternity of cabbage, carrots and other root vegetables which may help explain their popularity. Ramps have a pungent aroma that very frequently makes me think of some exotic vegetable found deep in a primal, pine needle-strewn forest, where bears, deer and other assorted wildlife hide themselves away from the prying eyes of humankind. That’s the romantic in me speaking. A more down-to-earth description might be, that they smell of bear piss mixed with mothballed socks. I kind of adore them. Here, I’ve paired them with squid that have been gently poached in an olive oil bath, along with orange zest, scallions and garlic, and served with crispy roasted Yukon Gold potatoes. It’s a colorful and deliciously flavorful dish that straddles the boundary between winter and spring. Combine potatoes, 2 tablespoons olive oil, salt and pepper in a small bowl. Mix well to ensure that the potatoes are coated with oil and that the salt and pepper are evenly distributed. Transfer to a roasting pan or glass Pyrex baking dish. Roast the potatoes at 375 F for 30 to 35 minutes, or until the potatoes are golden brown and crispy. Remove from heat and cover with foil to keep warm. 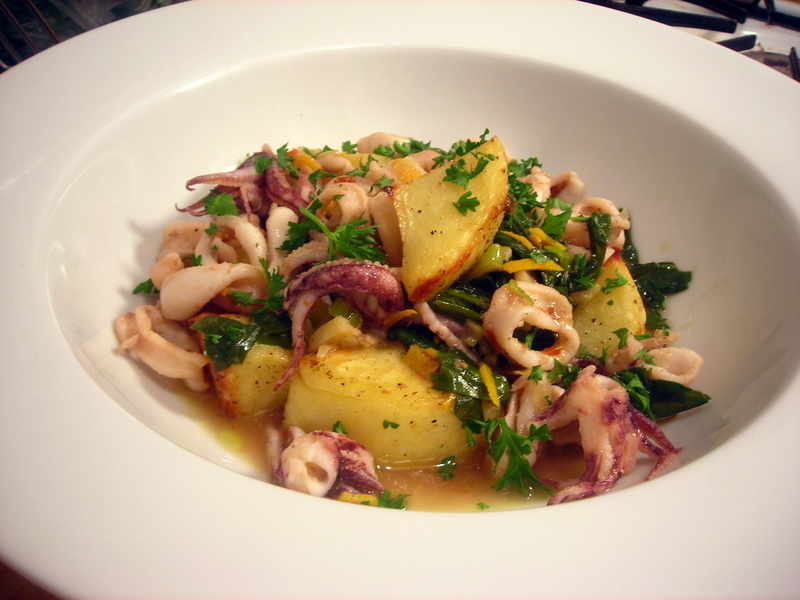 Place squid in a small bowl and sprinkle a small pinch of salt and pepper over them. Stir once or twice, then set aside while you proceed with the recipe. Add garlic, scallions, dried red pepper flakes and orange zest to a large, shallow pot, along with 4 tablespoons olive oil. Gently warm the oil over medium heat. Simmer five minutes until fragrant. Ensure that the ramps have been blotted dry to remove any excess moisture before adding them to the pot. Add ramps, tossing with the olive oil mixture. Add a pinch of salt, if desired. Cook, stirring frequently, until ramps have wilted, about 1 minute. Add squid to the pot; it may spatter a bit. Cook, moving the squid in the oil so that it cooks evenly, until it turns opaque and the tentacles become lavender, about 1 1/2 to 2 minutes. Taste for salt and pepper. Stir in a little lemon juice if desired, and scatter some chopped parsley. To plate, spoon potatoes into a shallow soup bowl. Top with squid, ramps and aromatics, along with a little poaching liquid. This is my contribution to Weekend Herb Blogging #327, which is currently hosted by Terry of Crumpets & Co.. Weekend Herb Blogging is a weekly food blogging event organized by Haalo of Cook (Almost) Anything At Least Once and was originally begun by Kalyn of Kalyn’s Kitchen. 29 Mar	This entry was published on March 29, 2012 at 1:56 pm. It’s filed under cooking, food, food photography, recipe, spring, winter and tagged cooking, dinner, food photography, gluten-free, potatoes, ramps, recipe, squid. Bookmark the permalink. Follow any comments here with the RSS feed for this post. no squid for me thank you; rather rubbery if I remember correctly. they only turn rubbery if you overcook them. Pingback: WHB#328 …il “Raccolto” – The Recap « Crumpets & co.